This unique piece was constructed using reclaimed wood and is big enough for breakfast in bed for two, or an evening with popcorn in front of the TV. 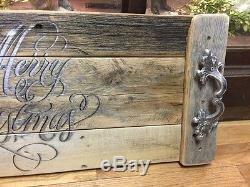 This Holiday tray is trimmed with the stencil, Merry Christmas in silver and charcoal! 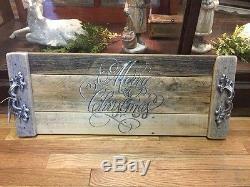 This gorgeous tray will impress your company at any festive event! HANDMADE IN THE USA, and numbered. This item has felt pads on the bottom and a gorgeous Cheistmas tencil adorning the top! 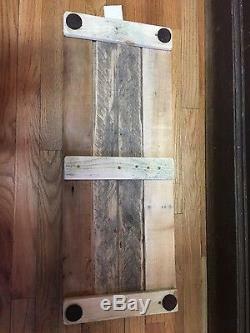 29.5" long x 11.5" wide. 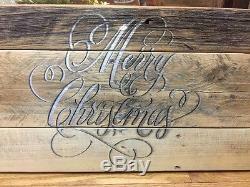 The item "Christmas themed- CUSTOM RECLAIMED WOOD SERVING TRAY MADE IN USA" is in sale since Saturday, November 19, 2016. This item is in the category "Home & Garden\Kitchen, Dining & Bar\Dinnerware & Serving Dishes\Trays". The seller is "milfordmills" and is located in Milford, Michigan.